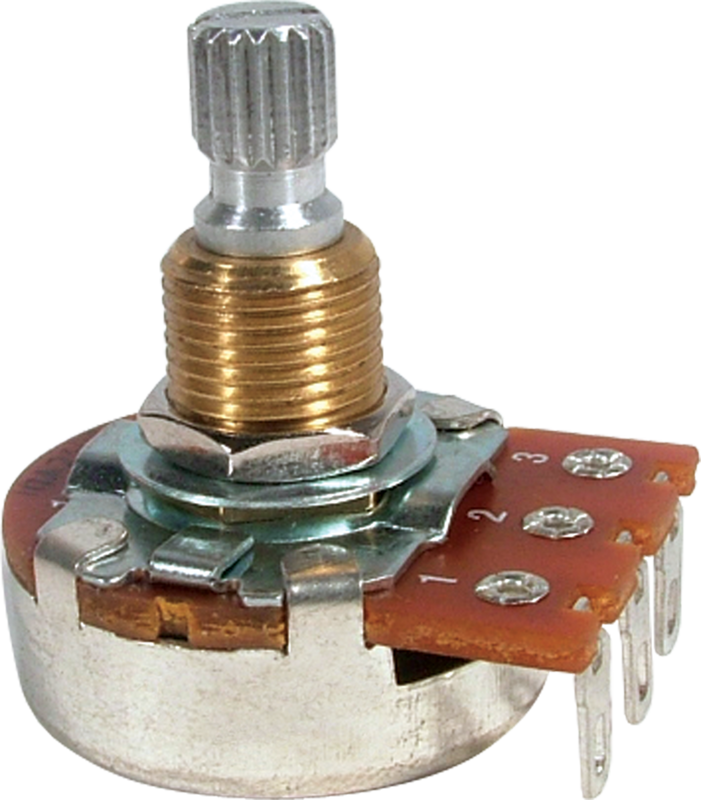 Bourns Audio Taper Potentiometer. Carbon Element, Split Shaft, Solder Lugs. 1 MΩ R-VB1MA-SP Packaging Dimensions 1.201 in. x 1.185 in. x 0.97 in. 1 MΩ R-VB1MA-SP Weight 0.034 lbs. 250 kΩ R-VB-250KA-SP Body Depth 0.45 in. 250 kΩ R-VB-250KA-SP Body Diameter 0.95 in. 250 kΩ R-VB-250KA-SP Bushing Length 0.38 in. 250 kΩ R-VB-250KA-SP Packaging Dimensions 1.3 in. x 1.3 in. x 1 in. 250 kΩ R-VB-250KA-SP Shaft Diameter 0.235 in. 250 kΩ R-VB-250KA-SP Shaft Length 0.38 in. 250 kΩ R-VB-250KA-SP Shaft Rotation 300 deg. 250 kΩ R-VB-250KA-SP U.S. Thread Major Diameter 0.375 in. 250 kΩ R-VB-250KA-SP U.S. Thread Pitch 32 tpi. 250 kΩ R-VB-250KA-SP Weight 0.03 lbs. 500 kΩ R-VB-500KA-SP Body Depth 0.45 in. 500 kΩ R-VB-500KA-SP Body Diameter 0.95 in. 500 kΩ R-VB-500KA-SP Bushing Length 0.38 in. 500 kΩ R-VB-500KA-SP Packaging Dimensions 1.3 in. x 1.3 in. x 1 in. 500 kΩ R-VB-500KA-SP Shaft Diameter 0.235 in. 500 kΩ R-VB-500KA-SP Shaft Length 0.38 in. 500 kΩ R-VB-500KA-SP Shaft Rotation 300 deg. 500 kΩ R-VB-500KA-SP U.S. Thread Major Diameter 0.375 in. 500 kΩ R-VB-500KA-SP U.S. Thread Pitch 32 tpi. 500 kΩ R-VB-500KA-SP Weight 0.03 lbs. 1 answers Will this 500K pot work as volume control in my guitar? Yes, this will work as a volume pot. 1 answers Are these low friction pots? Yes these are low friction pots. Excellent replacement for stock, cheap Chinese pot. A noticeable difference. Excellent upgrade from stock, cheap Chinese pot. A very noticeable difference. Based on the price, I should have known what I was in for. These cost almost half the price as CTS pots and the feel reflects the price. The pots have barely an resistance, and have a cheap, scratchy, poor quality feel to them when they're turned. One of them started going after a few minutes.